Last episode we discussed how the two opposing fleets got to the battle of Jutland, when we covered what happened with the battlecruiser forces under Beatty and Hipper met. This week we pick up at that point with the battlecruisers of the two Admirals fully engaged with each other. There was however another group about the enter the battle and that was the 5th Battle Squadron and its 4 Queen Elizabeth class superdreadnoughts under the command of Evan-Thomas. They would soon enter the fight and swing the balance of power very far into the favor of the British, at least until a little group of ships called the German High Seas fleet under the command of Scheer arrived from the south. We will close out this show by looking at what Jellicoe has been doing during all of this fighting, as he steams to the south without really knowing what he was running into. At the very end of last episode Beatty had turned away from Hipper after having two of his ships blow up to give himself some room. As the distance between the two groups of ships increased the rate of fire decreased as ships began to move either out of range or out of vision of the other ships. While Beatty was not purposefully bringing the Germans into range of Evan-Thomas, that was exactly what was happening. Just a bit after 4PM Evan-Thomas, after being separated from Beatty for all of the fighting up to this point, finally came within range of Hipper's ships and began to fire on the Von der Tann at a range of 19,000 yards. His ships shot a few ranging rounds then, when all of his ships were within range Evan-Thomas turned to starboard so that he could bring all of his monster 15 inch guns to bear. The first two ships, the Barham and the Valiant fired at the Moltke while the Warspite and Malaya fired on the Von der Tann. The two German ships soon had shells falling all around them, and also onto them. The Moltke was hit in one of the 5.9 inch broadside turrets, putting it out of action, the Von der Tann had the worst of it though. One of the shells that hit the Von der Tann actually penetrated under the water and resulted in 600 tons of water being taken onboard. At the front of his line Hipper was just getting the news of the new British ships and he ordered his ships to increase speed to 23 knots to keep the British ships at a distance. This change in speed, coupled with Beatty turning back into Hipper, meant that the distance between the two lines decreased rapidly, at one point Beatty was steering 34 degrees into the Germans. Evan-Thomas was also now within 14,000 yards of the German ships, well within proper firing range. The firing got so heavy and so accurate that the Moltke and the Von der Tann were forced to start a slight zig zag pattern just to try and through off the British gunners in the Queen Elizabeths however there was only so much they could do without losing too much straight line speed and letting the British get in even closer. At the front of the lines, as they closed, hits started registering again on both sides. The Lion hit the Lutzow, the Queen Mary the Seydlitz. The Von der Tann landed a shot on the New Zealand, the Moltke on the Tiger. The New Zealand then hit the Von der Tann again, putting its forward turret out of action, at roughly the same time another shell hit the Von der Tann's rear turret, rendering it also inoperable. The Von der Tann was quickly running out of guns, but it had no choice but to stay in the line. Throughout all of this movement two ships were focusing fire on the Queen Mary, both the Derfflinger and the Seydlitz, and at 4:24 tragedy struck. At that time the Derfflinger hit the Queen Mary near the Q turret, followed closing by more hits in the exact same spot. Suddenly there was a giant explosion, followed by a massive spout of flame, then another explosion and more flames. Then there was a final explosion, larger than the others, that rocked the entire ship, which quickly rolled to port and sank. The British had now lost two battlecruisers with almost their entire crews. Beatty, sensing that things may be quickly turning against his ships decided to switching things up. During all of the fighting a small fleet of 12 British destroyers had been trying to stay in position to deliver or repel a torpedo attack on the enemy, Beatty now ordered these small ships into the deliver their deadly payloads. Hipper, seeing this happening, then sent 15 destroyers of his own to do exactly the same thing. The British were able to avoid all of the German torpedoes, but one of the British fish struck home. The Seydlitz was hit by one of the 20 British torpedoes near the forward turret, creating a hole 40 feet long and 12 feet wide. The ship, even taking on tons and tons of water, was able to keep pace and keep her spot in line. At 4:43PM, after another critical development in the fighting, Beatty recalled the destroyers and headed north at max speed. 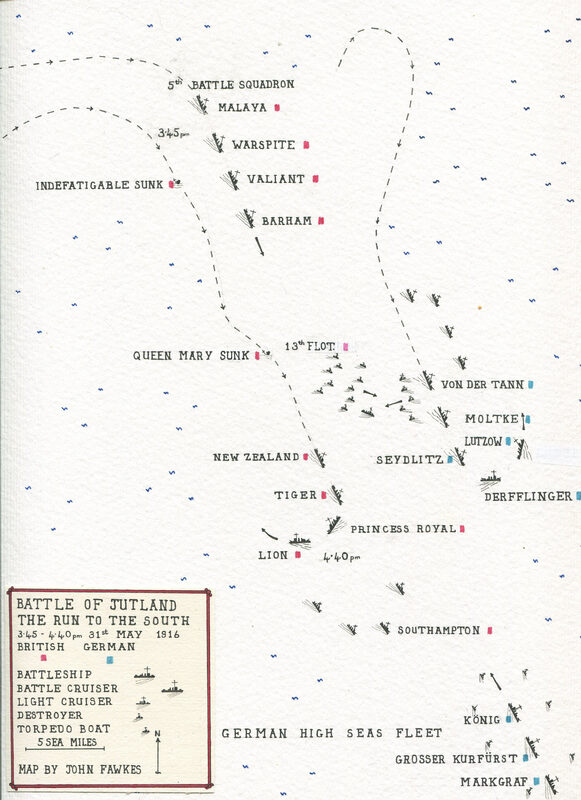 The phase of Jutland known as the Run to the South was over, and the British had lost badly. However, now it was time for the next phase of the battle to begin because that critical development I mentioned was none other than the appearance of the German High Seas Fleet in all of its strength and glory, for the British it was now time to turn and run. When the fighting had began Scheer and the High Seas fleet were about 50 miles to the south of Hipper, an hour later Hipper was able to see Scheer as Hipper sailed southeast while Scheer sailed North. This was at the end of a bit of complicated maneuvering from Scheer as he tried to properly put his ships in the precisely correct place for an ambush. This involved him first heading north before contact was made, then west when Hipper sighted Beatty, then a race directly north again once Evan-Thomas came into the battle. This was all done to try and place the British ships between the two sets of German ships. They were however unsuccessful because Scheer opted out of it when Evan-Thomas entered the fray. For the British it was very fortunate that they were able to learn of Scheer and his position before he got on top of them. This was due to Captain Goodenough and his 2nd Light Cruiser Squadron. During the run to the south the British light cruisers had been struggling to get and stay ahead of Beatty to try and execute on their scouting mission. At this critical point they were well positioned, or at least positioned well enough to save Beatty from disaster. At 4:35PM the lookouts on Goodenough's ship the Southampton saw to their southeast the High Seas Fleet coming out of the mist. 3 minutes later there was a contact report radioed to Beatty containing all of the information that they had "Course of the enemy's battle fleet is north, single line-ahead. Composition of van is Kaiser class…destroyers on both wings and ahead. Enemy's battle cruisers joining battle fleet from the north." With this threat now on the field Beatty did not immediately turn north, instead he decided to continue on his course to the south for a few more minutes. This was not because Beatty was stupid but instead he wanted to confirm the German ships himself and at 4:40PM this was done. As soon as it was apparent that the contact report was correct Beatty gave the signal to his ships to "Alter course in succession 16 points [or 180 degrees] to starboard." I quote this order because the wording will end up being important. It was very specific and contained the phrase "turn in succession" not just turn, turn in succession. This meant that instead of just turning around, the line of the British ships should all follow the ship in front of them to pass through the same point that the Lion passed through when it turned. This was a perfectly fine, perfectly valid order, however in this specific situation it caused some problems, especially for the 5th Battle Squadron. First of all, by telling Evan-Thomas how to turn it reduced Evan-Thomas' ability to alter the course of his ships action. This was the least of his problems though, because the order was also delivered to Evan-Thomas far too late. Beatty had turned his battleships just in time to stay out of the range of the German dreadnoughts, but the signal had not been properly relayed to Evan-Thomas via signal light. This meant that Evan-Thomas was not given the order until he passed Beatty while Beatty was already on his way north. Then a further delay happened when the signal to turn was not taken down until 6 minutes after they were given to Evan-Thomas. As I mentioned last episode, order were not to be executed until they were hauled down, not when they were received. This brought Evan-Thomas closer by the minute to the German guns. All of these problems combined to result in Evan-Thomas turning north just 21,000 yards from the German fleet. By the time the turn was being executed, the British ships were already within the range of the German guns. One officer aboard the 5th Squadron would describe it as a "very hot corner" as the German shells fell hot and heavy around them. Luckily for Evan-Thomas all of his ships were able to make the turn without incident and at 5:05 the turn was completed and the firing resumed from the 5th Battle Squadron. 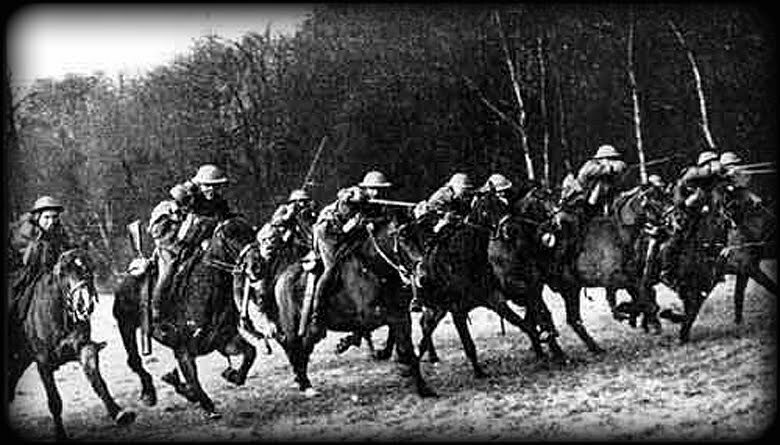 During this time the Germans had been racing north at top speed to try and catch the British ships as soon as possible. There were even a few shots fired at the British battlecruisers as they made their turn at absolute maximum range. By 5:08 at least 5 German dreadnoughts were all firing at just the last few ships of Evan Thomas' squadron. Evan-Thomas was again somewhat lucky in that the Germans had sort of lost formation in the proceeding 20 minutes. Scheer had ordered a slight turn after sighting the British ships, but instead of all making the same turn at the same time and staying in formation the German Divisions had started to drift apart in some unfortunate ways and some hefty gaps developed between ships. This meant that they were unable to engage the retreating Evan-Thomas with the maximum number of guns. Even with these errors on the German side the British were still heavily outgunned and they were on the run to the north, starting the next phase of the battle, creatively called the Run to the North. Robert Massie, in his excellent book Castles of Steel said of the Run to the North that "This hour--from a few minutes before five o'clock, when the Queen Elizabeths wheeled north 3 miles in Beatty's wake, until just after six, when they joined the Grand Fleet battle line-was their time of glory." A turret officer on board the Malaya does a pretty good job of explaining why “When we turned I saw our battle cruisers proceeding north at full speed, already seven or eight thousand yards ahead of us. I then realized that just the four of us of the 5th Battle Squadron would have to entertain the High Seas Fleet—four against perhaps twenty." The 5th Battle Squadron was now, essentially, engaged with every German ship by themselves. Beatty had raced to the north and out of the battle, at which point he sloed down for half and hour and allowed his ships to do come much needed repairs including some very serious firefighting. The Lion, Tiger, and Princess Royal had all been hit about 15 times with the New Zealand being the lucky one with barely a scratch. Back in the battle the 5th Battle Squadron raced north at 25 knots with the Barham and Valiant assigned to continue firing on the German battlecruisers while the Warspite and Malaya engaged the German dreadnoughts on their tail. While they were firing they were also of course receiving fire. The Barham was the first to be hit, but the Malaya and Warspite also received several hits during the journey north. While getting hit was never desired none of the ships were disabled or slowed in anyway, which was very important. If any of the Queen Elizabeths would have been hit in their engines or damaged enough to slow them down they would have had no chance of survival. Even just a few knots slowed and they would have found themselves in the middle of the German High Seas Fleet in a matter of minutes. On the German side, after the British had turned to the north Scheer had sent the signal to pursue the enemy to all of the German ships, this was easier said than done for the German battlecruisers in their beat up state. They still turned but here is a run down of the damage by this point in the fighting. The Von der Tann which could now not fire a single of her guns but she stayed in the line in an attempt to draw fire. The Lutzow had been hit several more times from the 5th Battle Squadron which knocked out both the main and reserve wireless transmitters. With Hipper on board and no wireless he now had difficulty not just communicating with his ships but also with Scheer. The Seydlitz was by far the worst off of all of the German ships though. What was left of her guns had been knocked out by 3 hits from the Queen Elizabeths and her list to port from the earlier torpedo hit was just getting worse. All of the ships stayed in line though, if only barely. It is somewhat amazing that all of these battlecruisers would make it through the battle, even with their current state and how much fighting was still left. Scheer and Hipper did not care about damage to the battlecruisers, what mattered was closing in on the 5th Battle Squadron and knocking one out. At this point in the fighting both admirals believed that they were facing just two British squadrons that were now isolated and on the run, all that was left was to run them down. After half an hour of respite Beatty signaled his ships to once again prepare for action and turned his ships back into the fray once again. Hipper saw him come out of the mist on his port bow, but he could not report to Scheer the ships were coming back into the fight, again no wireless. What he had to do was to send the message to the next ship in line via flag signal, who would then transmit the message the Scheer. This method of playing a game of telephone slowed down communication greatly. In front of him Hipper could see that Beatty was trying to get ahead of Hipper and cross his line, this forced Hipper to turn with Beatty to the east. This put the British in a much better position due to the sun and the wind and as they closed to about 14,000 yards they took advantage of this by quickly landing another hit on the Derfflinger which filled her torpedo room with water. At 5:45PM a lookout on the Lion saw something, and quickly passed it along to the rest of the ship, with Beatty confirming it just a few minutes later. To the north they had spotted Jellicoe. To keep the Germans from also spotting the Grand Fleet Beatty turned in toward Hipper, forcing him to turn as well. This kept the secret from the Germans for another 10 minutes, but at 5:55PM one of the German light cruisers, scouting to the north signaled to Scheer that they were in action with British dreadnoughts. This action was far to the east from where they knew that Evan-Thomas was and it could mean only one thing. At 5:59PM the front ships of the High Seas Fleet broke through a line of heavy mist and behind, on the horizon, possible disaster. 24 British dreadnoughts and countless other ships were bearing down on them, now only 16,000 yards away. Now it was time for the Germans to run. So far we have been keeping up with Beatty and Hipper and then Scheer arrived at the beginning of this episode. Now that Jellicoe has arrived we should probably catch up with what he has been doing since the initial sighting of the ships by Beatty. Jellicoe was on board his flagship the Iron Duke when the shooting started at 3:48PM, at which point he was 52.5 miles from the fighting. When the first sighting was made his ships were spread out in lines of divisions, or lines of 4 ships each, which was typical cruising behavior. At the time of the first shots he ordered each line of ships to close up to be 2,000 yards apart. This meant that when the ships deployed into line, and each division got behind the other, they would be only 500 yards apart. It is worth nothing that Jellicoe was in the center line of the British fleet, this meant that when the line of battle was created he would be in the middle of the line instead of at the front. This would have ramifications later. The closer the ships were to each other while in the line the better, because it would let the British concentrate their vastly superior firepower more effectively against the German fleet. After Jellicoe sent a message to the Admiralty that "Fleet action is imminent" at 4:51 he sort of falls off the action until he appears on to the north of Beatty. Part of the problem was that when Jellicoe reported his position to Beatty at 5:13, it was about 8 miles off which meant that Beatty was not expecting Jellicoe to show up where he did. Jellicoe was sort of flying blind in the hours before the battle. He had many reports of action at various places but due to some slight errors in ships reporting their own positions the situation was very confused. Jellicoe needed information though, he needed as much information about the German fleet as he could get. In theory it was hoped that Beatty would be constantly feeding information to Jellicoe to help him make decisions, but as it was Beatty had been sucked into his own battles and was failing at this task. At 6:01 he radioed Beatty asking where the enemy was, but he received no response. One very important question had weighed on his mind in the hour before 6PM and that was how he should deploy the fleet into battle order. There were a few different considerations and then two different decisions to make. The first was when to deploy. Jellicoe did not want to deploy too early, this would slow his rate of advance and greatly hinder the fleet mobility as they were forced to follow the first ship in the line. Jellicoe also did not want to deploy too late, or his ships would be a disorganized mass of confusion when the Germans appeared. Jellicoe also did not want to deploy the wrong direction. If he formed his line to the left, which each set of ships coming in behind the ships to their left and instead he needed to turn right there would be a lengthy delay before the position could be corrected. Without new information from Beatty Jellicoe was forced to consider the information he had and make a decision at 6:15. This would result in him being ready for the Germans but also not being perfectly placed, in fact he would be sailing away from the Germans while his ships got in order. Soon however they would be heading the right direction after a bit of course correctly, and then they would finally find their prey, which we will discuss next week as the two largest fleets in the world met on a tiny areas of the North Sea.